It was a very successful apple crumble indeed! By the time daylight had risen the following morning it had almost disappeared, so I dashed outside, crumble in hand, to take a quick snap before it all disappeared! My best friend was coming round for supper and the Housework Fairy (all 6’3″ of him) was cooking up one of his stupendous curries. I decided to reclaim at least one chopping board in the kitchen, and a saucepan and a shelf in the oven and whip up an apple crumble for pud! Not exactly ‘whip’, more peel & rub & sprinkle! We have bramley apples by the score here at the moment – I collect an armful whenever I pop down the garden to have a chat with Flora and then stack them up on a patio chair ‘cos I like the colours and it looks all bountiful and Autumny when I look out of the window! As I was assembling said crumble, I rummaged for something or other in the cupboard and came upon my SECRET INGREDIENT. A couple of generous spoonfuls were added to the crumble mix (OK, so you’ve discounted cloves and spices – these were big spoonfuls)! When we’d finished our curry – absolutely delicious curry – we waited for a respectable few minutes before diving into the crumble. I made them guess what I’d added. What do you think I added? 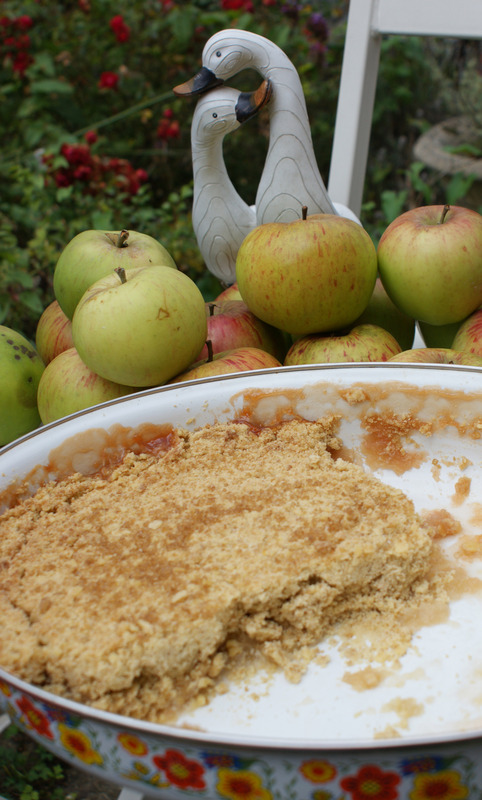 Here are a couple of clues … it sort of reminds me of bedtime when I was little; it’s not too strong a taste but when added to a crumble it works perfectly – especially with apples I think! If anyone guesses, I’ll tell all – if not, then it’ll have to remain a secret!!!!! Go on, have a guess! Mmmm, a secret ingredient, I often add ground almonds…always nutmeg & sometimes biscuit crumbs… Now the housework fairy is sounding good- I have a hoovering fairy who sometimes does the windows does that count? A housework fairy does dishes, recycling stuff & the washing – as well as hoovering! We only clean the windows if we’re moving – we’re not!!! No – you haven’t guessed the secret ingredient – go on – bedtimes, old-fashioned (a bit), goes well with apples. Time for another guess??? Well done! Definitely worth adding – delicious! You are currently reading Secret ingredient for success … at Adaliza.